First scenario: you walk into a room full of theoretical physicists talking about dark matter, gravitational waves etc. Second scenario: you walk into a room full of biologists discussing about CRISPR, chromatin organisation etc. From your perspective, in which of the two given scenarios will you find it easy to network? It is likely that you will find networking in the second scenario much easier. This is primarily because the second scenario is within your comfort zone. For PhD students, first scenario is quite similar to when they start their PhD and have little knowledge about their field. At this stage, they are likely to face some communication barriers while networking and can often be scared just by the thought of networking. But as you progress through your PhD, you acquire in-depth knowledge which makes you confident and allows you to participate in the discussions. Ms. Elisabeth Pain in her blog correctly points it out that even though most of us know that networking is important for success, we still find it hard to go up to someone and start a conversation . In this blog, I am going to share some tips on how to be effective in networking. Networking is an investment in your future. It takes time and when done correctly can yield great results for years to come. Networking is an important process in starting to build a relationship at a business level. The first step is to be confident. Secondly, you should be willing to push yourself beyond the comfort zone boundaries. 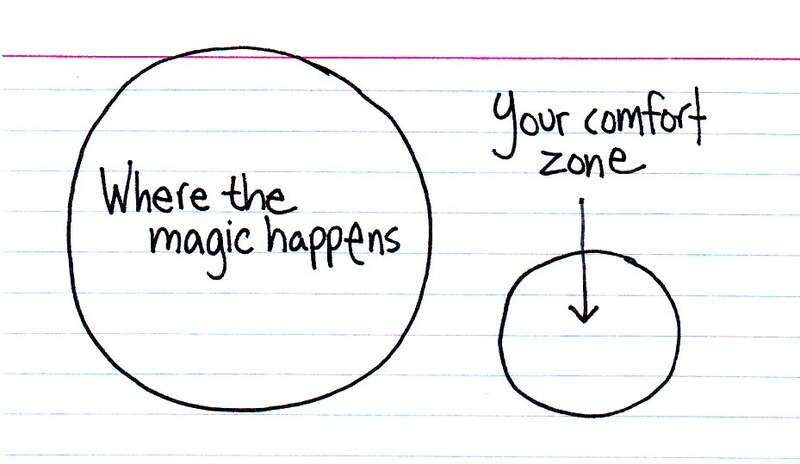 The comfort zone is the state of mind where someone does not feel at risk or at harm. It is like giving a presentation about an experiment e.g. western blot, which you have done previously, surrounded by the your lab group (people that you are familiar with). But if asked to present in front of a different lab group then you will be a bit scared before doing that. Similarly, for networking one has to surpass the initial fear and be confident to go up to someone and start a meaningful conversation. In human genetics field, American Society of Human Genetics (ASHG) annual meeting attracts ~ 8000 participants every year. Now it is quite impossible to be able to network with all these participants unless you are giving a keynote speech. So, it is recommended to conduct a research beforehand about the presentation and poster talks which are of your interest . This will help you organise your schedule. Also, you will be able to narrow down to a list of few presenters with whom you want to directly interact with. Using this approach during ASHG 2017 made me more efficient and as a result I was able to network with plenty of speakers. At big conferences, you will hardly meet the same person twice. People are generally very busy, so you have to be efficient in your interactions. Developing an elevator pitch will help you reach that goal. It makes you sound logical while communicating about your current and future research goals. An elevator pitch comprises of a short introduction about you, your current research and your future plans. Spend some time working on the elevator pitch before going to a conference. I was motivated to do this after attending the Conference to Career program developed jointly by ASHG and The Jackson Laboratory. You can read more about this using this link (elevator speech). You can discuss about the weather, governance issues etc. while networking but that will not benefit your research knowledge. You have to be strategic while speaking to someone for the first time. It is always good to start with complementing their research work. If you know about their research then you can directly ask specific questions. Apart from asking research-based questions you can also conduct an informational interview. Informational interviews comprise of questions regarding their career decisions and milestones. It will guide you about the steps that you should take if you decide to pursue a similar career. You can find out more about informational interview using this link (Informational interview) . Remember networking is a two-sided process. You should give equal discussion opportunities to the person you are networking with. You can get eager to showcase your achievements and milestones but be mindful and give an equal speaking opportunity to the other person. If you don’t have a time constraint, then try to network with as many people as you can. This includes people whom you meet in elevators, lunch sessions and even while taking the same long walk to the lecture hall (unless you are running out of time). Since, other people attending the conference are likely to have similar research interests. There is a good chance that the other person can offer you help or for you to have an opportunity to reach out to them. You won’t know unless you interact with them. In past, this approach has led to successful development of various large-scale companies and technologies. Interacting once at conference is the first step for building a successful relationship. But strengthening the relationship requires further nourishment. If done right, it can take you places! That is why this is a very important tip. To build a strong connection you should invest some time in following up with the people you met at conferences. Nowadays, social media has made it relatively easier to keep in touch with people. So, make sure you connect with these people on LinkedIn or follow them on Twitter, ResearchGate etc. You don’t have to attend to each and every conference for expanding your network. There exist other opportunities as well e.g. if you find the technique in a paper very interesting then you can complement the authors. If you have questions or concerns regarding the paper then you can ask them directly to the corresponding author. If you are interested in their research work then you can write to the lab’s principal investigator and seek potential collaboration opportunities. Be open to giving invited seminar talks at departments in your and other institutions. Having a bigger network is desirable but always prefer a network with strong interactions. Science is amazing when done collaboratively. Networking is an important step for establishing collaborations. The more you network, the stronger potential you will have to ask great research questions. I am delighted to share all of this all with you and hope that you find this blog useful. I am also thankful the organisers of The Conference to Career program from ASHG and The Jackson Laboratory for helping graduate students like me in overcoming our fears while networking. Finally, networking is fun! Since you are going on a journey to make new friends, make sure you enjoy it. Happy networking! Joey Mark Santiago Diaz (University of Leeds) and Saumya Dushyant Sisoudiya (Baylor College of Medicine) provided feedback and proofread the blog.